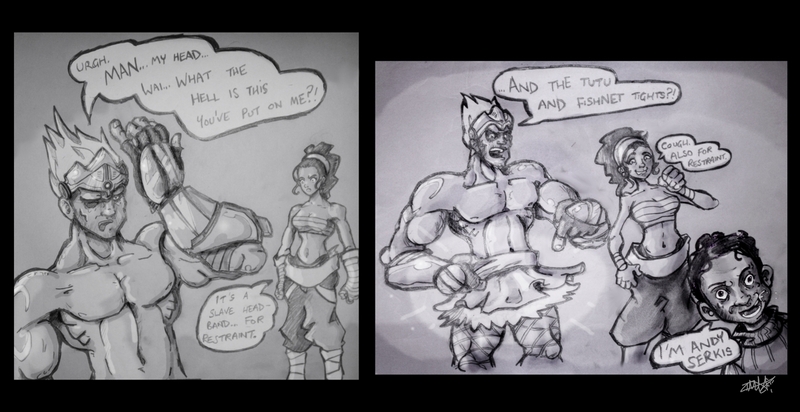 Your Daily Dose of Sketchy Videogame Humour! Enslaved: Odyssey to the West is best described as "very tenuously" inspired by "Journey to the West", Ancient Chinese lore that's inspired a crazy amount of other stories and media, including cheesy show "Monkey" and anime staple "Dragonball". The game follows the main character, the agile brute-like fellow named Monkey (fancy that), and his captor Trip, who has enslaved him as a personal bodyguard as she tries to get home. At the beginning of the game, they both narrowly escape a nasty demise, but only after Trip lands an escape pod on Monkey's face, knocking him out long enough for her to fit a slave headband on him - effectively allowing her to restrict, hurt, or even kill him. I actually have a similar setup with my dad; Simply allowing him to ingest a multipack of Stella Artois, which knocks him out long enough for me to fashion my own "Slave Headband" - a bacon sandwich with brown sauce. When he awakens in pain from the Lagery Coma, so long as I possess the sandwich, I have absolute power over him. Try it out on a your family this Christmas, perhaps you can have your own enslaved bodyguard; for practicality I recommend a burly uncle, but for entertainment, little cousin Timmy.